Pennsylvania is a state in the eastern part of the US. It's state nicknames are Keystone State and Quaker State. It's motto is Virtue, Liberty and Independence. 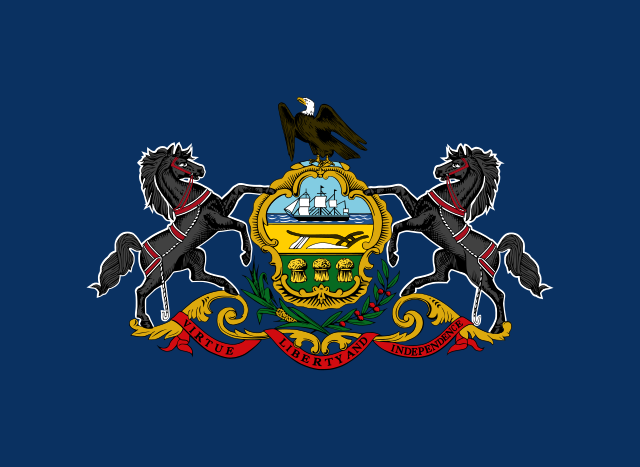 The flag of Pennsylvania is blue, with the state seal on it. The state seal has an American bald eagle, horses, ships, a plough, wheat sheaves, an olive branch and a corn stalk. The chocolate capitol of the US is in Hershey Pennsylvania, where Hershey's chocolate is made. They have a place called Chocolate World where they have information about how the chocolate is made, and a roller coaster park nearby called Hersheypark. Philadelphia was a very important city through American history. It was the capitol in the Revolutionary war, it was the location where the declaration of independence was signed, and it is where the liberty bell is along with more statues than any other city in the US.